I review a lot of mobile and smartphones and one of the common questions is which is better: Apple’s iPhone or one of the Google Android phones. 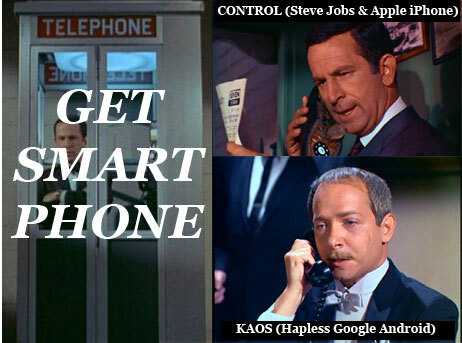 The cult classic TV series “Get Smart” featured a constant fight between the agents of Control and KAOS and I’m going to use this metaphor to describe the main differences between iPhone and Android. Control (Apple iPhone) offers people the simple choice of one premium priced phone and one cheaper previous generation phone, a strictly regulated environment with rules, an easy inbuilt way to buy content like music etc, consistent design principles with an emphasis on aesthetics/good looks and a vast number of Applications to choose from. One company controlls the user experience from end to end. On the other hand the agents of KAOS (Google Android) offer people a range of free cloud internet based services, the ability to completely customise their phone and the choice of vastly different phone handsets from many companies eg: the huge 5″ Dell Streak smartphone/tablet to the tiny Sony Ericsson X10 mini and many other shapes and sizes in between. No company controlls the user experience from end to end. 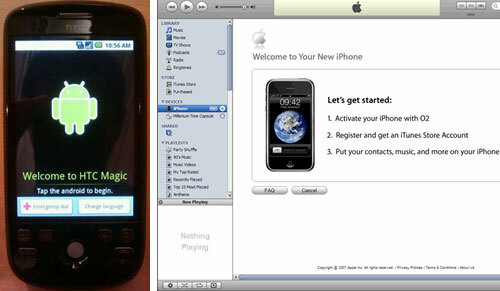 An Apple iPhone needs to be connected to a computer to be intially activated and to be updated with new software versions. Android phones just need a 3G or WiFi internet data connection to set them up, no need for a PC or extra software. Some Android phones receive updates to new software versions automatically over the internet but others need to be connected to a computer to get upgraded so this can be confusing. 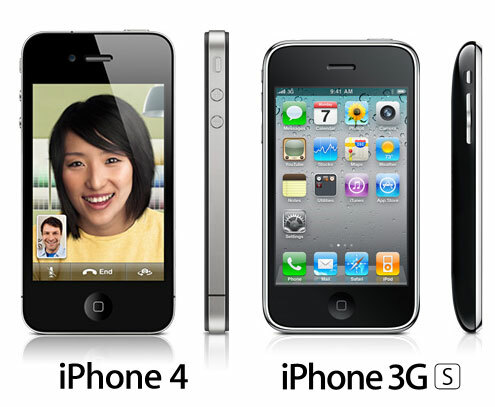 The Apple iPhone platform has both a wide variety and depth of really useful applications (apps) as well as staggering number of them (over 250,000) compared to Google Android phones which have access to around 100,000 apps at time of writing (Sept 2010). Realistically although the iPhone has many more apps, most of the key apps are common to both phone platforms. The iPhone still has the edge over Android in some areas such as Games and Banking apps. Apple iPhone has quite a generous amount of storage space built in to the phone (16gb or 32gb) so people dont have to add it themselves but the downside is there’s no way of expanding this storage space. Google Android phones can have storage via a microSD card slot, inbuilt phone storage, or both. The benefit is that people can choose how much storage they want to buy and take the microSD card out of their phone to move data to a computer or another phone but on the flip side some apps can be confused by files being split across inbuilt phone storage and a microSD card. Apple has long taken the slow and steady approach to adding features to the iPhone with a new phone released once a year. This can be seen as a benefit as features are carefully planned ahead or to take a cynical approach, a way of getting people to buy a new phone every year by drip feeding new features. 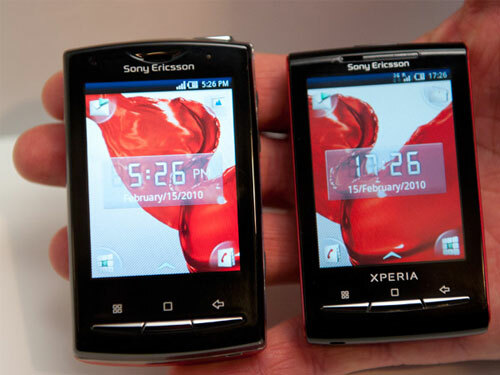 Either way its easy for people to decide which phone to buy as it’s obvious which is the best or cheapest. In comparison there are dozens of Google Android phones available in all kinds of shapes and sizes, with prices ranging from a few $100 to around $1000. Quality, features and designs also vary widely with some phones offering an excellent user experience but others a very poor user experience. It’s up to people to do their own research and figure out whether the Android phone they’re interested in is great or terrible. For the moment Apple’s iPhone is better at managing music collections and synching them between peoples computer and iPhone/iPod but that assumes iTunes works reliably, which isn’t always the case. Google Android phones treat music as a large collection of files which can be copied/synched from a computer by accessing the phone storage as a USB drive which is flexible but not as automated and hands off as iTunes. Apple makes people pay AUS $119 a year for Mobile Me, a service which automatically syncs your email, contacts, and calendars over the air across all your devices. You can only use the inbuilt Apple app for certain types of apps eg: Mail. Google Android phones have all those features built in for free if you use Google Calendar, Gmail for contacts etc. If you want to use a 3rd party mail app, browser etc you’re free to install it. A multitasking smartphone can do many different tasks things simultaneously and alert you immediately if any of these tasks have a message for you eg: play an Audible audiobook which you’re listening to, track your walking path via GPS and log the speed, check email every 5 minutes, check twitter every 5 minutes. All Google Android phones can do this for all their applications. Initially only Apple apps on iPhones could multitask but Apple has added a kind of controlled multitasking for certain types of 3rd party apps eg: background audio listening and GPS location apps. The downside is that if lots of apps are running at once they could all be using battery life and possibly downloading internet data as well. Articles in the technology media are usually styled to ask questions like Who Will Win: iPhone vs Android for retail customers? 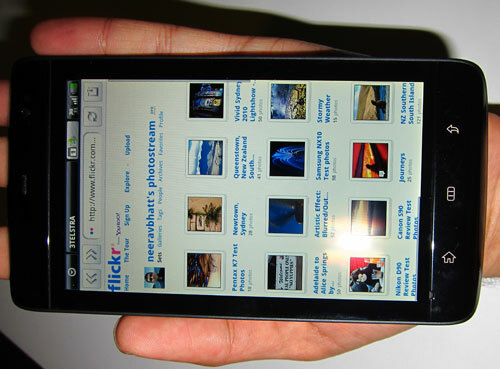 or Will iPhone edge out Blackberry in the corporate market? I think they miss that “winning” is relative. Apple would feel they’ve won if they can hold onto 5% market share in the smartphone market, if it’s the top 5% most profitable customers. Nokia and Google Android phone manufacturer partners would feel they’ve won if they can keep a substantial stake in the overall smartphone market and make money in volume sales rather than a high profit margin. Blackberry can survive for a long time if it remains the most trusted corporate communications smartphone which corporate IT administrators can lock down to ensure organisational information is kept safe. Note and Disclaimer: Thanks to unlocked online phone seller Mobicity for providing the loan Android phones mentioned in this article for review purposes and to 3 Mobile for supplying phonecall credit and mobile internet data for these phones. Good article. I’ve been a Nokia supporter for the last 18 years or so, but starting to think I should maybe go down the Apple or Android route now. I’ve got to say the iPhone is an amazing piece of kit so to is the ipad. Thanks for the excellent article, he recently acquired Android, and now happy! This is a insightful article, thanks for sharing. I am a big fan of the iPhone and I am overall impressed with the quality of some of the popular iPhone Apps available on App Store. Singapore iPhone users are still on the rise and iPhone seems to have a firm position as the market leader in this country. I believe that Android will soon catch up as it’s a great OS to begin with, but I am not so sure about the hardware that the Android is running on is as good as in terms of functionality and quality of an apple device. I think if you are a “marriage between hardware and software” person Apple wins every time. But, when it comes to features / bells and whisles – android takes the crown.